Alma Thomas proves you can work your whole life and still have enough time to follow your dreams. Thomas was born in Georgia in 1891, on the cusp of the 20th Century, and she was a witness to the great technological changes that would come rapidly during her lifetime. In high school, she wanted to be an architect and concentrated deeply in her math classes. Of course, job prospects for African American women in the early 1900s weren’t exactly booming, so Thomas took up a teaching position instead. In 1921, she enrolled at Howard University and gradually drifted away from her economics major and into the school’s art department (newly founded by black Impressionist painter James V. Herring). She became the school’s first graduate in Fine Arts. From there, she earned a master’s degree from Columbia University’s Teachers College and studied painting at American University. Basically, if there was a good school willing to teach Thomas something about art, she was enrolling. Though she was very invested, she rarely painted herself, and took up a permanent job teaching art at a junior high school instead. It wasn’t until she retired in 1960, at the ripe young age of 69, that Thomas devoted herself completely to painting for the next 18 years. She produced an amazing body of work—so much so that one of her paintings has even hung in the White House! Unlike most of us, Alma Thomas went full throttle after she retired. She took up acrylics and watercolors and sought to “concentrate on beauty and happiness, rather than man’s inhumanity to man” with abstract paintings consisting of rhythmic webs, mosaic patterns, and block brushes of color. The New York Times called her work “Monet meets Mondrian.” We think she’s pretty out there, too. Her decision to be an abstractionist during the pivotal Civil Rights Movement broadcasts its own kind of political sentiment (that a woman of color might simply want to paint, for one), though Thomas was not political, nor was she sentimental. She may have deflected sentiment and mysticism in her work by giving her paintings amusing titles, like Scarlet Sage Dancing a Whirling Dervish or White Roses Sing and Sing or Red Azaleas Singing and Dancing Rock and Roll Music or, a personal favorite, Snoopy Sees Earth Wrapped in Sunset. When asked if she sees herself as a Black artist, Thomas proclaimed: “No, I do not. 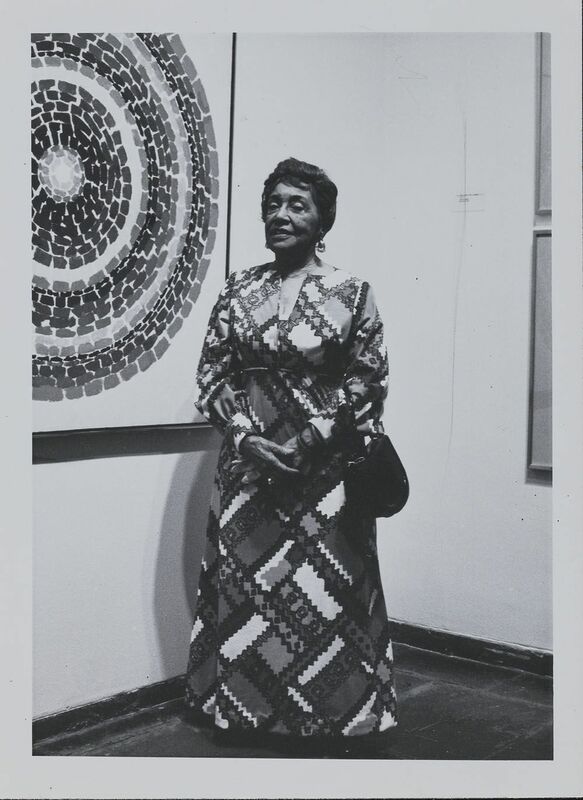 I am an American.” Be that as it may, it is worth noting that Alma Thomas was the first Black woman to receive a solo exhibition at the Whitney Museum. Her resilient optimism for the possibilities of humanity and progress come as a breath of fresh air to us now during these trying times.